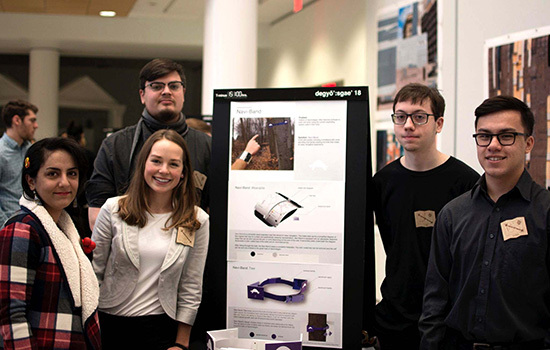 Kaitlyn Gillmor, a second-year industrial design student at RIT, was one of approximately 300 students to participate in T-minus, a one-week intensive project that connects industrial design students across all program years. Gillmor, from Canandaigua, N.Y., was the leader of this year’s winning team. When she’s not in the design lab, Gillmor enjoys rock climbing, organic farming and baking. Answer: I was initially attracted to RIT because the school offered the opportunity to integrate a co-op into their academic programs. Then I found the industrial design program, and I was sold. Q: What led to your decision to major in industrial design? A: One of my professors once said that industrial design is the world’s best-kept secret, and it truly is. I have always loved to draw and create, but I also find enjoyment in math and science. Until I discovered the field of industrial design, I never thought it was possible to incorporate both passions into a career path. I chose this major because it allows me to be creative and analytical, which is incredibly exciting. Q: How would you describe T-minus to students outside of your major, and how many years have you participated in it? A: T-minus is an intensive team project within the industrial design program. Working in teams of five (one student from each grade level), we are given a week to complete an assigned sponsored project given by a company or organization outside of RIT. I have now participated in T-minus for two years. Q: How was this year’s project different from previous years, and what was your team’s design solution? A: This year’s project was different from previous years because we designed a system and an experience rather than a product. Also, this project greatly emphasized understanding a new culture and co-designing with that culture. Our team redesigned the way-finding system for the hiking trails at Ganondagan (Seneca Art and Culture Center in Victor, N.Y.). Visitors were frequently getting lost while hiking and most visitors didn’t want to carry maps with them. My team created a two-part system as a solution. The first part was a wristband that displayed a simplified trail map with a removable key. This worked along with the second part: a color-coded trail marker that wraps around the trunk of a tree, and has a track that allows the marker to expand as the tree grows. Our solution created navigational clarity, while incorporating the culture values of the Seneca people. Q: What was your favorite part of the week? A: My favorite part of the week was meeting new people and learning from them. The people at Ganondagan were great to work with and helped me gain an understanding and respect for the Seneca culture. The people on my team worked extremely hard and created a fun atmosphere. All of these people made this an amazing experience. Q: Why is a project like this important for industrial design students to participate in? A: I believe the importance of participating lies in the opportunity to collaborate with students across all program levels. There are so many talented and wonderful people in the industrial design program, but you usually only meet a few students outside of your grade level. Having the opportunity to learn from and be inspired by people who are both younger and older than you is invaluable, and that is exactly what T-minus provided. Q: What are your future plans, following your time at RIT? A: After RIT, I will pursue a career in eco-innovative design. So many incredible things are being done, like taking recycled plastic from the ocean and turning that material into shoes and other soft goods. Using the power of design to create environmentally and socially impactful solutions is my dream. 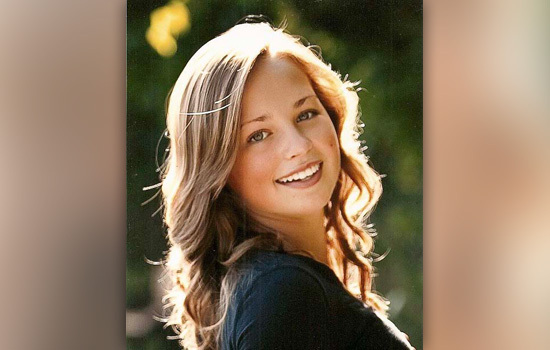 Lauren Peace compiles “Student Spotlight” for University News. Contact her at lmp1579@g.rit.edu with suggestions. Kaitlyn Gillmor and her team present their design at the conclusion of T-minus.